Is worry a waste of time? 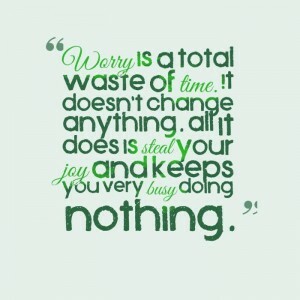 Do you think worry a waste of time? Many of us spend too much time worrying, instead of pursuing our goals. Sometimes we worry about things, because of a fear of regret. Ironically, regret often comes from not having done something, rather than the regret of doing. I always remember an article that stayed with me. The Guardian article lists the Top 5 most common regrets of the dying. A sombre subject, but enlightening. It can help us realise what really matters to us. Whatever is bothering you today, would it make your own personal top 5 list? Is the worry worth how much time it consumes? I wish I hadn’t worked so hard Read & Discuss ». Whatever you make of this list, maybe there’s something of value you can take from it. I know whenever I have worries, I remind myself of this list, and try not to let them prevent me from living my life to the fullest. The points that resonated most with me are about family. Living far from home means booking time off work to see them. and makes me value every moment with them. And the point about happiness. We can’t control everything, but can certainly help ourselves in many ways. Some people are worried about going to the gym, because they feel their their ‘body type’ wouldn’t be welcome there, when exercise can be for everyone. Some people are worried about starting a dance class because they don’t know any moves…but everyone is a beginner to start with, even the top professional dancers! Some people are worried about the best ways to look after their health, because of conflicting advice online. It’s not one size fits all! Everyone is different with different nutritional, physical and emotional needs. 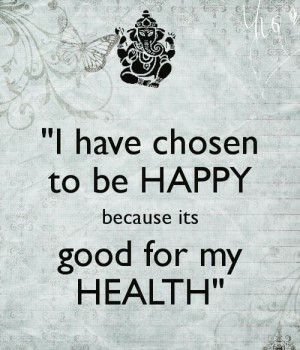 You’re the ultimate decision maker when it comes to your own health and happiness.